Well due to the weather I decided to leave the blogs for a while. We have had the worst run of bad weather in the history of the Shark Cage Diving. In August the boats only managed to get out to sea for 13 days and in September 18 Days so far. This was a really bad run and I am speaking now from my office with Gale Force winds pounding everything outside! We are all miserable here and cannot wait for summer to arrive!! Ok we do not get very cold conditions but the wind has been relentless and with that the big seas have kept us on land more than on the water! The Great White Sharks have also been acting very strangely this winter season and we have spent most of the time still at the beach where we would normally be at the Island. The sharks normally move from the Island to the shoreline from October to end of March but we have not seen it this year! One of the boats only worked at the Island for 2 days the whole winter and found sharks at the beach every day when we able to get out to sea. On the days we got out we had great sharks but the visibility at the beach is always poor so when we were are the beach we had an average of 3 meters visibility. This is not great for cage diving although this does give an eerie feel to the dive especially when the sharks comes out of nowhere with teeth & all! 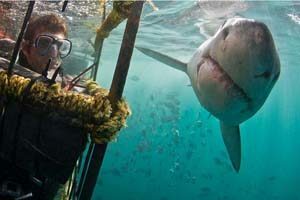 The sharks come inches from the cage so divers still got to see the sharks up close and personal! The great thing also about poor visibility is that the sharks seem to know that they have the upper hand and on most days we get multiple ambushes on the bait with regular half and near full breaches right next to the boat and cage. This is what we are looking forward to through our summer to come, unless the sharks decide to go to the Island now.. we will see! We have had some rough but doable days at sea. With the bad winter weather hitting the coast Simons Town is protected by the Cape Peninsular Mountains. Seal Island is approximately 16km from Simons Town harbour and by the time we get out to the Island we are affected by the strong winds but the swell is mostly blocked by the headland. This means we can get out there for people with sea legs and the sharks have been fantastic. We are coming to the end of September now and we are still getting good shark activity at Seal Island with multiple predations on seals still being witnessed in the mornings and if we are lucky a full breach on the decoy just like in the movie Air Jaws! The tours run early morning and we first look for sharks attacking seals before towing the fake seal (decoy) behind the boat to try to provoke a breach. Following this we anchor at the Island and drop the cage in next to the boat. We have had an average of 4 sharks around the boat each tour and it is great to be out at sea seeing the sharks when up the coastline in Gansbaai it is impossible! The Seal Diving is still out of season due to the weather. The winter storms really mess up the waters around Duiker Island by Hout Bay. We tried to run a couple of tours this week but the weather proved to be too much and we will just have to wait for a good run of weather before we can jump in with these awesome ‘dogs of the sea’. We weather down south has been affecting the eastern coast as the cold fronts roll up the coastline. We have had some excellent days out at sea but have also had to battle on through rough seas and windy conditions. The visibility has not been too good of late unfortunately but we have had some stunning days between the bad weather. The good thing about this time of year is that we are guaranteed to see many Ragged Tooth Sharks on Cathedral reef and Raggies Cave. We are also seeing many Dusky and Black Tip Sharks on the dives but the Tiger Sharks are not around due to the cooler water temperatures. Summer is just around the corner however and the water will start to warm soon then they will be back! The cage diving has been good with multiple sightings of Black Tip and Dusky Sharks on the dives and as a bonus we are still seeing many Humpback Whales. The divers have been hearing the Whalesongs on most dives which is very special!